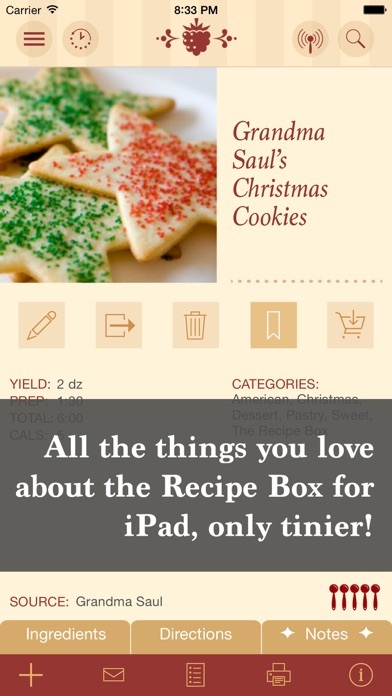 Create, display, and manage your very own recipes with one of the best loved recipe managers in the app store. 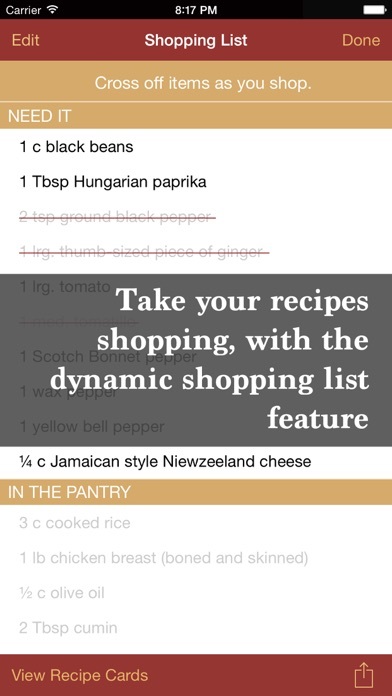 The Recipe Box To Go lets you pull up your recipes whenever the mood strikes, so you can shop for tonight's dinner or share with friends. This 21st-century cooking tool helps you get your recipes into a quickly-sorted, easily shared format that can’t be misplaced, covered in stains, or catch on fire. New and Notable January 2012 — iTunes App Store EASY ENTRY • One-touch Instant Import from dozens of popular websites (See support site for list) • Transfer recipes from any email or text document with copy and paste • Fully flexible entry fields allow for imperial or metric units • Write notes while you cook without leaving the display screen POWERFUL MANAGEMENT • Swap and sync with other users or other devices with Recipe Link • Search for multiple ingredients simultaneously • Cross-reference recipes in multiple categories • Sort and rate recipes • Email ingredients as a clickable shopping list • Email import/export and printing • Access your recipes without an Internet connection • Back up recipes through iTunes file sharing BEAUTIFUL GRAPHICS • Luscious typography and professional layout design • Switch easily between multiple recipes while tracking the current step • Highlight steps in the directions with a tap • Dim ingredients as you gather them IN-APP SUPPORT • Tutorials to guide you through various functions • Quickly send feedback or ask questions Please write to us with your questions! If you’re having an issue with using the app, we’re here to help. If you leave your questions here on the iTunes reviews, we have no way to write you back. Also, don’t forget to check the website for our tutorials and FAQs which we are always working to improve based on your feedback! The import button on the iPhone will not work. 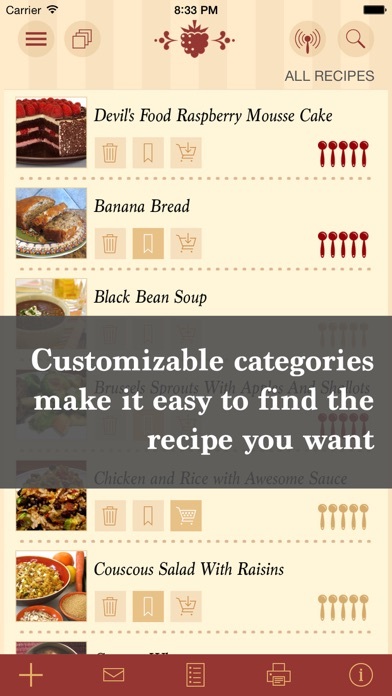 I deleted the app on my iPhone and when I redownloaded it, all my recipes were gone. What happened?? 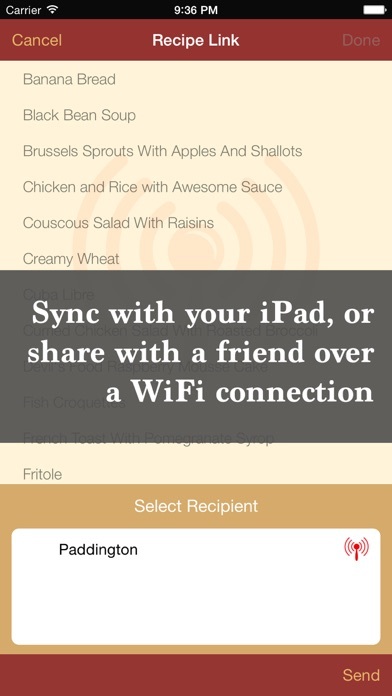 Now when I want to import from my iPad to iPhone it will not import. What happened??? I always loved this app. I have had this app on my iPad for 10 years and just added it to my iPhone. It works great for me. It isn’t perfect but I wouldn’t give it up. I loved this app. 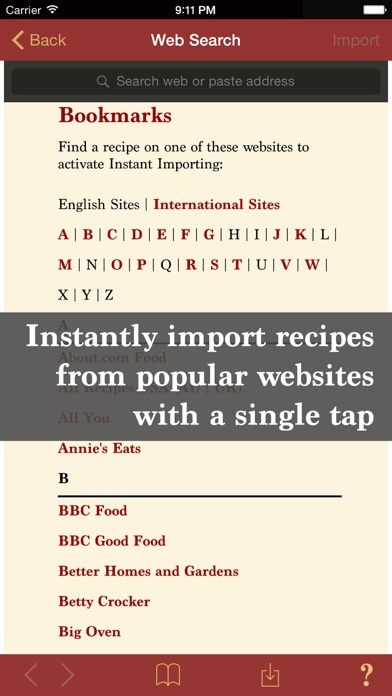 But suddenly my recipes are gone! Ugh. So disappointing! No support and app is buggy as ever. I had to delete my previous glowing review. Backup feature doesn’t work anymore either so I will probably lose my 3,000 recipes I painstakingly put in it. Too many bugs. Do not buy. Was great, can be again! Really hope this is still an “active” app. The developer has not updated for over a year. Would love iPhone X support and fixes for import and copy. Took the time to add all my family recipes to these, really hope it doesn’t just fade away or become completely inoperable. Contact the developer stopped working and is marked “under construction” My advice, find another app and save your current recipes before the app is unusable and they are all lost! I agree with others that this was a great app but has fallen short with updates & fixes. Please fix because I do use this app often.